The Great Pyramid of Giza (also known as the Pyramid of Khufu or the Pyramid of Cheops) is the oldest and largest of the three pyramids in the Giza Necropolis bordering what is now El Giza, Egypt. It is the oldest of the Seven Wonders of the Ancient World, and the only one to remain largely intact. 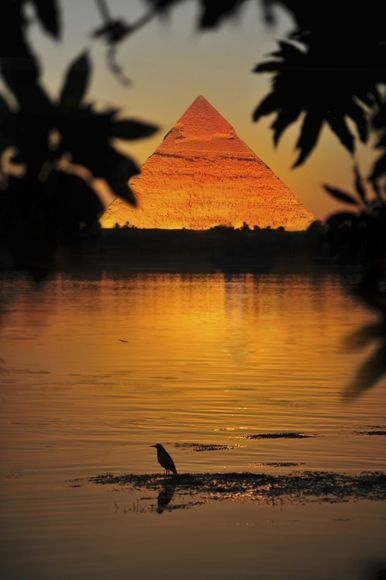 Egyptologists believe that the pyramid was built as a tomb for fourth dynasty Egyptian Pharaoh Khufu (Cheops in Greek) over a 10 to 20-year period concluding around 2560 BCE. Initially at 146.5 metres (481 feet), the Great Pyramid was the tallest man-made structure in the world for over 3,800 years. Originally, the Great Pyramid was covered by casing stones that formed a smooth outer surface; what is seen today is the underlying core structure. Some of the casing stones that once covered the structure can still be seen around the base. There have been varying scientific and alternative theories about the Great Pyramid's construction techniques. Most accepted construction hypotheses are based on the idea that it was built by moving huge stones from a quarry and dragging and lifting them into place.